Hello and a Happy New Year!! I am so sorry for the pretty outrageous amount of time since my last blog post – I was busy exploring India and then by the time I got back to the UK I was wrapped up in all the magical Christmas madness. I hope you’ve all had a lovely break and wishing everyone the best for the year ahead! 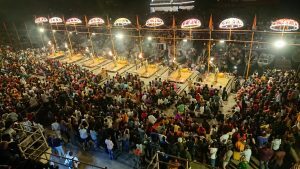 Over the next week or so I’m gonna attempt to recap some of the key places I visited while travelling and first up is Varanasi…. We took an overnight train from Agra to Varanasi which was a really fun experience and you can’t really go travelling in India without doing a single train journey! We were in the Second AC (2A) carriage class on the Marudhar Express and we left Agra Fort around 8.30pm and arrived in Varanasi the following morning about 11am. I had the top bunk and we had a good time watching the world blur past in the window and chatting to other passengers. 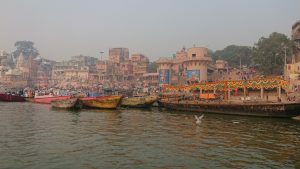 On our arrival in Varanasi, we first went to the hotel to freshen up, had some lunch and then wondered into the old part of the city late afternoon. 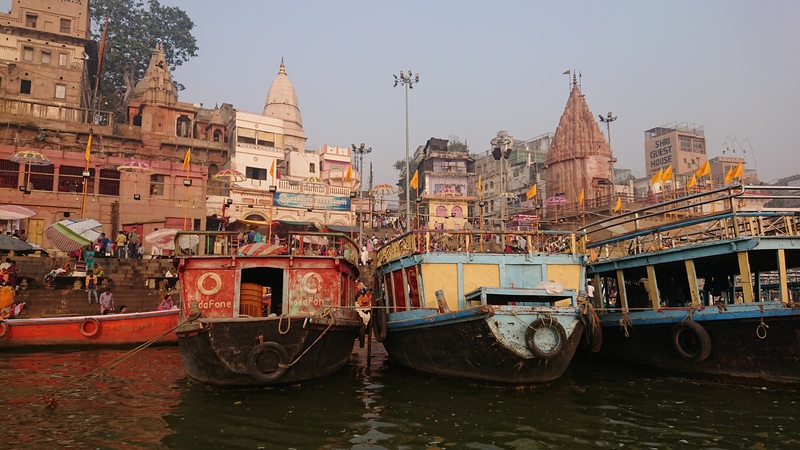 Varanasi is a famous Hindu pilgrimage site as it lies along the Ganga (River Ganges). Washing in the water of the river is believed to cleanse the soul of any sins and many Hindu’s travel from afar to touch the holy water. 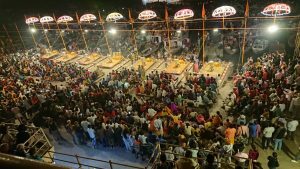 We watched the evening aarti along the Ganga at the Dashashwamedh Ghat which was really beautiful. The crowds really build up so it’s worth getting there early to get a good spot. The blowing of the conch signals the beginning of the aarti and the prayers are split into different sections; the lighting of the incense represents a prayer to parents and grandparents, the large tiered divos are a prayer devoted to Ganga and the cobra shaped lamp is a prayer to Lord Shiva. The prayers last around 45 minutes and it’s a great atmosphere with the crowds all singing along.